The last few years have seen a surge in the popularity of unmanned aerial vehicles being put to a variety of civilian uses. One of the lesser-known recent applications of drone technology is for aiding hunters in surveying hunting land, determining whether certain land hosts the game they're interested in and in finding an animal they may have hit to ensure it goes down. Several drones are excellent for these purposes, but several factors make some better than others. We've compiled a list of the five best options for hunting drones, and below we've included a guide that includes what to look for as well as tips on how to get the most out of your hunting drone. Check out this comparison table for the best hunting drones. The camera on the DJI Phantom 4 Pro V2 is stabilized on a 3-axis gimbal that can be pitched from -90 to 30 degrees making it easy to see what's on the ground below. The camera itself uses a 1 inch CMOS sensor that can take still images of up to 20 megapixels or can record video in 4k at 30 frames per second. At this resolution and frame-rate, the camera uses a 100 Mbps bitrate which lends incredible clarity and color to the videos that are captured. The Phantom 4 Pro V2 features downright impressive stats in regards to its flight capabilities. The drone has a maximum altitude of over 19,000 feet and can climb at a rate of about 18 feet per second. The drone boasts a top speed of 45 miles an hour and has a controllable range of over 4 miles. The intelligent flight batteries feature a flight time of about 30 minutes and are easy to swap out with a fresh battery in case extra flight time is needed. The Phantom 4 Pro V2 is arguably the least portable of the drones in the DJI lineup. Including the battery and propellers, it weighs just over 3 pounds and comes in at about 14 inches in diagonal length. Unlike the other drones in the DJI lineup, the propellers and arms of the Phantom 4 don't fold up for portability. The Phantom 4 can send a real-time feed to a phone or mobile device at either 720P or 1080p, both of which run at 30 frames per second, on any device running iOS 9 or Android 4.4 or later. Next on our list is the DJI Mavic Pro Platinum which, while slightly more portable, features a slightly weaker camera. The camera on the DJI medic Pro Platinum uses a similar but smaller CMOS sensor that is only capable of images up to 12.35 megapixels. The camera can also record video in a similar Ultra high-def 4K resolution but can only record at 24 frames per second. The video from the drone also has a maximum bitrate of 60 megabits per second as opposed to be Phantom 4's 100 megabits per second. The Mavic Pro Platinum uses an almost identical gimbal that uses 3-axis stabilization and can be pitched from -90 to 30 degrees. 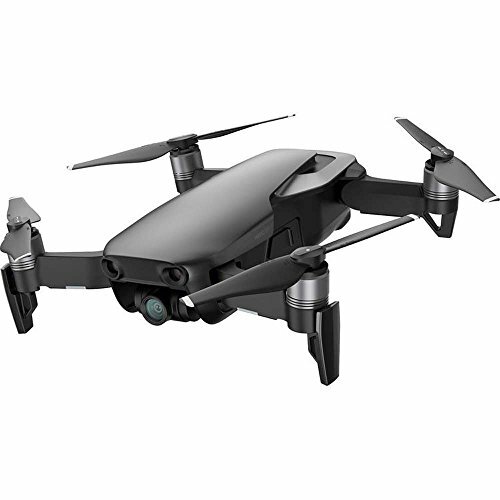 The Mavic Pro Platinum features a similar battery to the Phantom 4 that gives it a roughly 30-minute maximum flight time. The Mavic Pro also features a similar controller to the Phantom 4 giving it an FCC compliant 4.3-mile maximum range. Thanks to a top speed of 40 miles an hour and it's impressive 30-minute battery life the Mavic Pro has a total travel distance of about 9.3 miles on a still day. The Mavic Pro Platinum is a substantially more portable drone than the Phantom 4 coming in at only 1.6 pounds with propellers and a battery. While the diagonal measurement of the drone when fully extended for flight is about 13 inches across, the propellers and arms of the drone can be folded in for easier transportation giving the drone dimensions of only 7 and 3/4 inches in length and about 3 and 1/2 inches wide. This folding feature and it's lightweight makes it one of the most portable drones in its category with 4K video and a 30 minute flight time. Much like the Phantom 4 the Mavic Pro comes with a variety of sensors that look forward, backward, and down which gives both of these drones solid obstacle avoidance as well as some autonomous flight capabilities. While the DJI Mavic Air is the smallest drone in the DJI lineup it retains many of the impressive features of its larger brethren. The gimbal mount for the camera has the same three-axis stabilization capability as the Mavic Pro and Phantom and has a controllable range from negative 90 degrees to 0 degrees. The camera itself is capable of recording in 4k at up to 30 frames per second with a bit rate of 100 Mbps. At lower resolutions higher frame rates are available such as 120 frames at 1080p or 720p. The camera is also able to take still images of up to 12 megapixels with its CMOS sensor that can be used in single shot mode, HDR mode, or burst mode. Being the smallest drone represented in the DJI lineup also comes with some minor drawbacks. While the Mavic Air is still capable of a top speed of over 40 miles an hour total travel distance is limited by its maximum flight time. The smaller battery on the Mavic Air allows for only about 20 minutes of flight time. Likewise, the maximum controllable range on the drone is reduced relative to the Phantom and Mavic Pro to only about two and a half miles. 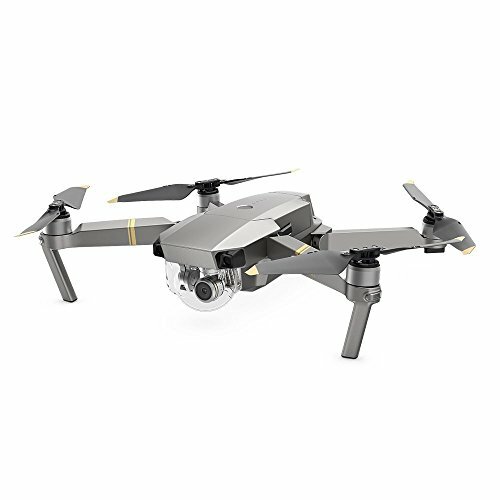 The most striking feature for most about the Mavic Air is its light weight and portability. The drone's takeoff weight comes in at just under a pound and when folded up completely is only 6.6 inches long and just over 3 in wide, meaning it can easily fit in the palm of your hand. Even with the arms and propellers unfolded the drone still only has a diagonal measurement of about 8.4 inches. The camera on the Autel X-Star Premium is comparable to that of the Mavic Pro. It rests on a 3-axis gimbal that features controllable pitch and can keep the shots stable and smooth even when flying at high speeds or changing direction. The camera itself takes 12-megapixel single shots and can be used in a burst fire or even time-lapse mode. The camera features a wide 108-degree field of view and can record at 4K resolution in 30 frames per second. The resolution can be turned down to 2.7k to run at 60 frames per second, 1080p for 120 frames per second, or 720p for an exceptional 240 frames per second. The flight time of the Autel X-Star Premium lies somewhere in between the Mavic Air and the Mavic Pro coming in at 25 minutes. The controller on the X-Star Premium is somewhat weaker than the ones DJI has to offer, with a maximum transmission distance of only 1.2 miles. While DJI has firmly seated itself at the top of the industry when it comes to drones, Autel is giving it a run for its money. 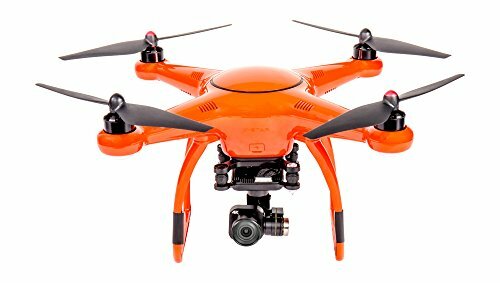 Their unique vibrant orange drones are easier the spot in the sky making them easier to keep track of and boast a number of features that make them more accommodating to newer pilots. The drones and their autonomous features which are guided by GPS positioning are geared towards safety, including an automatic return function when the battery begins to get low ensuring both your safety and the safety of your investment in the drone. The Autel Evo features a similar camera as the X-Star Premium. It is able to take single or burst shots of still images in 12-megapixel resolution that almost always turn out sharp and clear thanks to the 3-axis stabilized gimbal. Where the Evo exceeds the X-Star is that it can record 4K resolution video at 60 frames per second. It shares the X-Star's ability to record at 1080p with 120 frames per second and at 720p with an impressive 240 frames per second. The field of view for the camera on the EVO is slightly narrower than that of the x-star coming in at only 94 degrees. The Evo improves upon the X-Star Premium's battery life able to compete with the DJI lineup with a 30-minute flight time. The controller, however, can operate for up to 3 hours on a single charge and the batteries on the EVO are incredibly easy to switch out for a fresh pair when the first one dies. The Evo also matches the range of the DJI lineup at 4.3 miles yet again surpassing the other Autel offerings. The controller on the EVO features a bright 3.3-inch OLED screen built-in meaning you won't have to attach your phone to the controller in order to get a first-person view from the drone's perspective. The Evo can also fold itself up, much like the Mavic Pro, which along with the compact and self-contained remote makes the Evo a highly portable drone. The Evo also has top of the line obstacle avoidance that is powered by both GPS and ultrasonic sensors that work in unison to give the Evo some of the best hover stabilization of any drone. 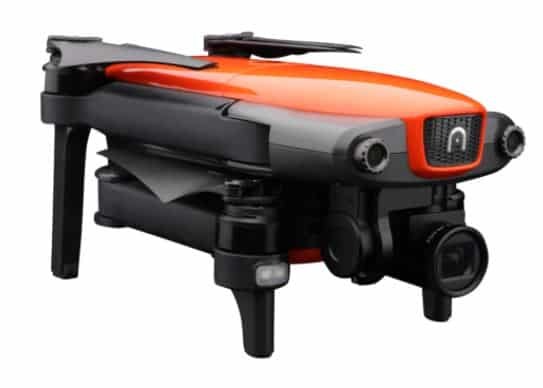 The Evo also comes with Autel's distinct bright orange color scheme making it easier to keep track of in the sky and when landing. Over recent years drones have become increasingly affordable while at the same time becoming capable of carrying high-resolution cameras and having more advanced batteries and controllers. These combined factors have made the commercial use of drones in many applications possible for more and more people. Some of the uses for drones coming into light in recent years are interesting and often unexpected. One of these uses is for aiding hunters in finding prey and inspecting plots of land for hunting. The ability to get a bird's-eye view of an area is almost invaluable to any hunter. While at times controversial, the use of drones in hunting in recent years has shown a lot of promise in helping hunters both save time and potentially protect ecosystems. The main use of drones in hunting is to scout out an area of land to see whether or not it has the animal that the hunter is interested in. By inspecting the land from the air it's easy to tell where an animal has been and roughly how many are present in the area. In this application, the use of drones in hunting is not considered unsporting, but rather just saves a lot of time and effort by preventing people from hunting on land that doesn't have the game they're looking for. Drones are also useful for those looking to lease out land for the purpose of hunting as they can take aerial photographs and video the show potential lessees what the plot of land looks like. Drones have been used with great success in the South where an outbreak of feral pigs is currently ravaging farmland and hunters have been enlisted to aid the farmers in ridding their land of the pigs. There are many critics of the use of drones in hunting who point out that there are a number of ways that hunters could potentially exploit the drones in unsporting manners. For example, one of the main concerns of people who critique the use of drones by hunters is that the hunter could lie in wait and use a drone to herd the animals towards him or force them out of the brush. Because of this concern many record-keeping organizations such as the Boone and Crockett Club have decided to strike from the record any animals that were taken with the assistance of a drone. Another concern raised by those who are against the use of drones for the purposes of hunting is that it could affect other hunters. Most drones that are powerful enough to carry a high-resolution camera use powerful but loud motors that create a harsh buzzing noise that is easily audible from the ground even when they're high up above. This noise can be very startling to animals and there are number of cases where hunters have been interrupted by another person's drone while out hunting. Not only could the loud buzz of a drone be disruptive to others who are trying to line up a shot or who finally have an animal that they've been tracking nearby but there's also the potential for animals to be scared off of a property all together. When certain games such as deer become alarmed or feel intimidated in a certain area it's possible that they abandoned the territory and simply never returned. For this reason many landowners are wary of allowing any drones in the air where they typically hunt. While there isn't a tremendous amount of evidence either for or against this idea it's worth keeping in mind. Because more and more people are flying drones these days in more and more areas the federal government has taken it upon itself to enact several laws to regulate the use of drones. At a federal level drones of all uses must satisfy a few conditions. Firstly, you must register your drone with the Federal Aviation Administration which also carries a $5 fee. The Drone must weigh less than 55 pounds, may not be flown higher than 500 feet above-the-ground, and you may not fly your drone at over a hundred miles an hour. It is also important not to fly your drone anywhere near any manned aircraft, and it's considered courteous to contact the airport if you are flying your drone within 5 miles of it. Finally, it is federal law that you must keep your drone within your line of sight. 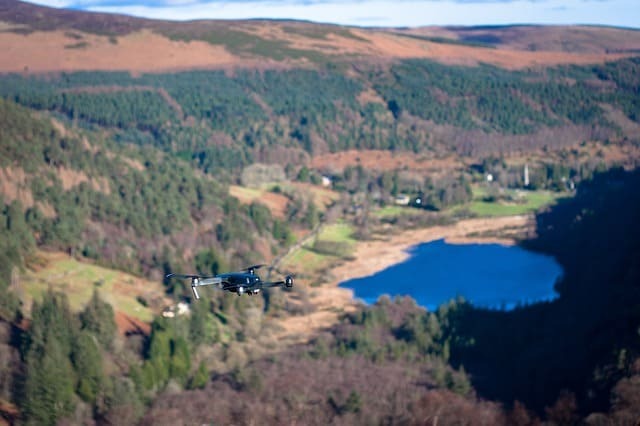 This means that if the area you plan on flying in is rugged terrain or has thick foliage it's important to get a vantage point where you can see the drone no matter where you fly it on the property. There are also many laws regarding the use of drones that are enacted by states and will change greatly on a state-by-state basis. Some states stick to the bare minimum level of federal regulation while others add on a great deal of additional legislature. For example, Alaska has laws that state you made not hunt on a property within 24 hours of flying over it. This permits the use of drones for surveying a parcel of land but prevents hunters from using the drone to herd the animals in a certain direction or during the hunt itself. A great place to find information on your state's local laws regarding drone use can be found here. The first and arguably most important factor to consider when looking for a drone to use in hunting is the camera. Every drone on our list is capable of relaying its camera feed back to a controller or mobile device so that the user can get a real-time first-person view from the drone's perspective. This is incredibly useful when scouting out a piece of land because it allows the pilot to see exactly what's going on beneath them in real time. Every drone on this list is also capable of taking still images as well as high definition video. 4K video is the highest resolution on the market and will offer incredible clarity when looking at what's on the ground. Many drones on this list can also record at lower resolutions but higher frame rates which can be useful when flying the drone at high speeds close to the ground or when trying to get a clear shot of a quick moving object. Higher frame rates lend themselves to smoother motion and less blurry footage. All of the hand-picked drones on our list also feature a 3-axis gimbal which allows for smooth and stable images and videos to be taken even when the drone is traveling at high speeds or changing directions. The next most important factor to consider is the battery life and range on the drone you select. Some drones with a less than 10-minute battery life make it difficult to fly out to the area you need to inspect, get the footage you need, and return to the ground in time. All of the drones on our list feature a 20 to 30 minutes flight time and can be controlled from at least a mile away. Depending on the size of your property and how long you intend to look for game from above it may be worthwhile to make sure you pick a drone with a 30 minute flight time to maximize the time you have in the air. 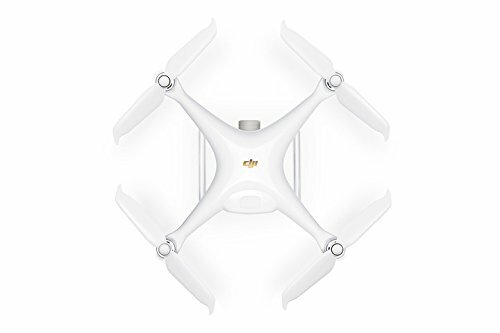 Many of the drones on this list can also have the battery replaced easily meaning once landed you can simply swap out the first battery for a fresh one then continue flying. When determining how much range you'll need on the drone it's important to remember that it is federal law to keep the drone in your line of sight while flying. If the land you hunt on makes it impossible to keep your eyes on the drone from more than a mile away it may not be necessary to get a drone with a range of greater than a couple miles. Other important factors for hunters looking at drones are the portability of the drone as well as what kind of autonomous flight features it has. Some drones such as the Autel X-Star and the Phantom 4 are pretty large and bulky and incapable of being folded up for portability. While this may not be an issue on nice days or short trips where you can throw the drone into the bed of a pickup without worry, the bulkiness of the drones can quickly become an issue. The Evo and Mavic Pro are both capable of folding the propellers and arms in making them substantially more portable and are also lighter than the Phantom 4 or X-Star. Finally, the Mavic Air is by far the lightest and most portable drone on the list. When it comes to autonomous features it's worthwhile to look for a drone that might have automatic landing when the battery gets low such as the Autel X-Star Premium. Every drone on this list features some level of the intelligent obstacle avoidance which is great for new pilots and experienced pilots alike as sometimes things outside of the field of view of a camera can pose a threat to the drone. The use of drones in hunting is a relatively new practice that is still developing. How much of an application it will have in the future is yet to be seen but being an early adopter seems to be a good choice in this case. Hunters can save tons of time not having to search land to determine whether it hosts the game they're looking for but instead can use their eyes in the sky to see if they'll be wasting their time. Any of the drones on our list will be great for this purpose and have been handpicked to excel as hunting drones.